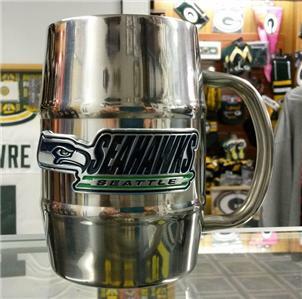 This Mug is Stainless Steel Inside and Outside. Decorated with a high quality metal team logo, Approximately 5.25" Tall. NOT dishwasher safe. NOT for use in microwaves. We accept Paypal and all major credit cards MC,VISA,AmeX,Discover,Diners Club. We offer very competitive prices on Hockey Cards and Other NFL,NHL,MLB,NCAA licensed items. We also donate 10% of our profits to youth sports and other needy organizations. Many of our items are listed on other auction sites so store inventory changes daily.